There are 734 modules, arranged sequentially over 24 levels, covering 4,000 words, including punctuated sentences. Your own experience of completing the early modules will give you an idea of how quickly a module might be finished, but each student works at his or her own pace and may repeat each module a much as they wish. Each of the 24 levels is structured in groups of five modules, four modules where new words are introduced, and the fifth as a diction module to test and reinforce learning. Whether you are using TTRS purely as a touch-typing tutor or as part of a phonics learning programme, it is recommended that all students being on Level 1, Module 1 and not skip any modules. TTRS is designed to be followed sequentially so as to develop the skill of touch-typing alongside the paced acquisition of the building blocks of literacy. When you enter into the Levels section you will see the words which are covered in each level. Level 1 introduces and names the vowels a e i o u. This is important information for readers, whatever the age. The course then moves on to combine vowels and consonants into three letter words. You may need to pay your students a little extra attention on Module 8 when capital letters are introduced. This is the first time that students will need to use both hands on the keyboard at the same time. From the beginning, students are encouraged to line up their fingers on the home key, and follow the fingers on the screen rather than look down at their hands and very quickly they are typing whole words without consciously thinking about how to do it. The course takes a whole word approach from here on. This is a significant strategy as it gives meaning to letter combinations. Traditional off the shelf touch-typing package often focus on random letters, and pressure students to reproduce them at speed. This is not the way students with learning differences learn best. Levels 2 and 3 use consonant clusters combined with vowels to draw attention to patterns of sounds and graphemes in the target words. We recommend that as soon as possible after the end of level 3, but based on your own judgement of when this is appropriate, you adjust the settings to move the hands from the keyboard as an indicator of where the fingers go. Levels 4 to 12 is where students are introduced to the vowels diagraphs and the simple spelling rules of the English language. Diagraphs are shown and spoken in isolation and then as part of words. Levels 13 to 20 include the less common spelling patterns and more complex spelling rules. They also incorporate the rule for suffixing and prefixing and the structure of syllables. Levels 21 to 24 include homophones, silent letters, countries, names and more advanced suffixing and prefixing. Throughout the course, every 5th module is a dictation module, designed to test and reinforce learning by presenting the student with the sound of the words which have been learnt in the previous four modules but without the words on screen to copy. Students, particularly those with language processing difficulties, may find it useful to hear a word several times and can do so by pressing the icon on the screen or the number 2 on the keyboard. To show a word, press the icon on the screen or press 5 on the keyboard. 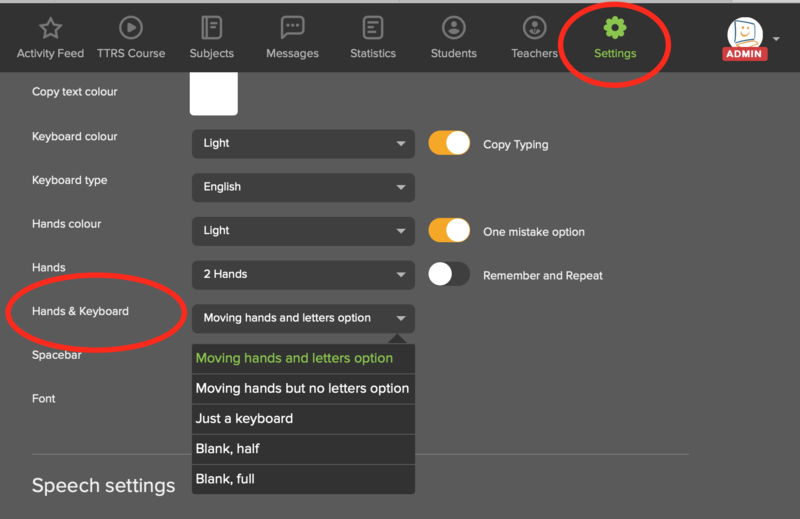 You can assess how your student is doing on a module with a quick glance at the keyboard screen. As the student works away, a thin bar running from top to bottom on the left indicates speed; the right-hand bar indicates the accuracy score, and the bar along the top shows where the student is within the module. At the conclusion of each module, a statistics summary is displayed giving that module's accuracy score and, if you have selected it within Settings, the words per minute (WPM) score. Above 95% is described as excellent and receives loud applause. Above 90% accuracy is described as good and receives light applause. By default, students need to achieve a score of 80% to unlock the next module. The pass mark can be changed in the Admin account by going to Settings > Student > Miscellaneous > Pass Mark required and changing the score here. 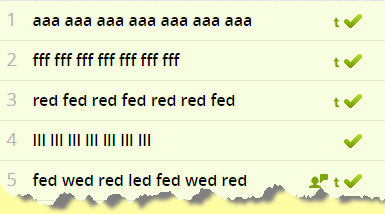 If the bars indicate high words per minute and low accuracy it may be that the student is going too fast. Stress the importance of accuracy before speed. With accuracy, speed will come automatically. 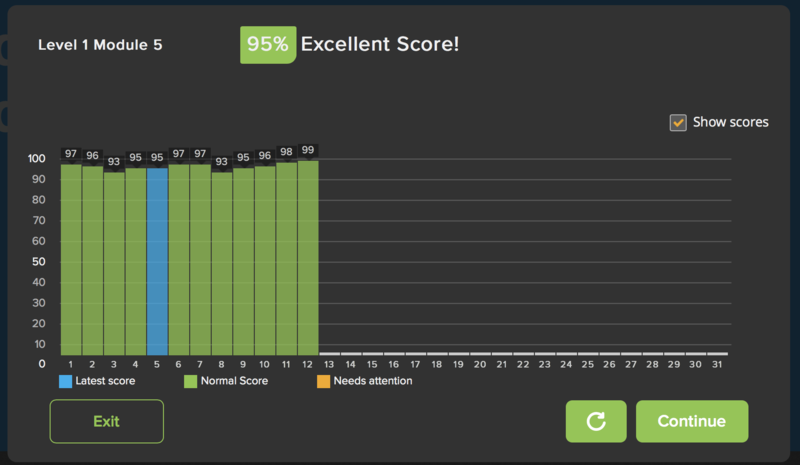 If the end of the module is nearing and a low accuracy score in indicated, you might suggest that the student restarts the module before registering a low score. Tip: Every time a student logs in, the TTRS system remembers their finishing position from the previous session and present their next module via the Resume course button.